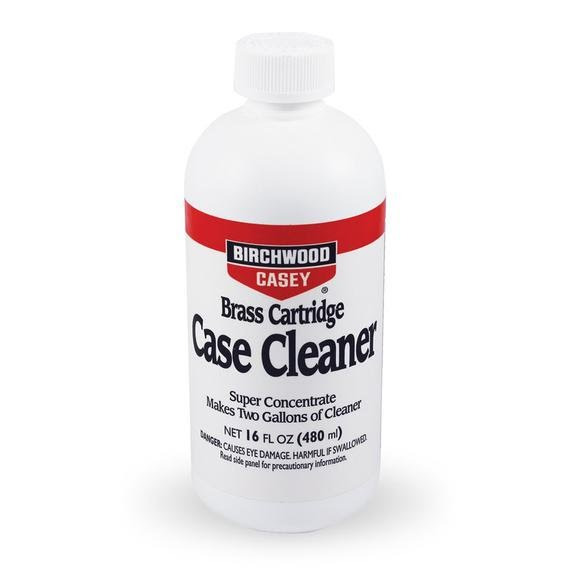 Birchwood Casey's Brass Cartridge Case Cleaner is super concentrated: this one bottle makes over two gallons of reusable cleaning solution and will clean 8,000 medium sized cases. Easily removes resizing lubricant, oils, grime and stains from brass cartridge cases. Restores them to original finish for reliable operation. Helps remove powder residue. Birchwood Casey &apos;s Brass Cartridge Case Cleaner is super concentrated: this one bottle makes over two gallons of reusable cleaning solution and will clean 8,000 medium sized cases. Easily removes resizing lubricant, oils, grime and stains from brass cartridge cases. Restores them to original finish for reliable operation. Helps remove powder residue. Brass Cartridge Case Cleaner is a safe, non-fuming, non-etching solution that won&apos;t weaken cases. Reusable, store solution in a plastic or glass container (not metal) and use when needed.